Before we discuss Khun Chao Tuam, the eighth lineage descendant of this distinguished line, we must pause to mention the outstanding contribution to Siam's history of Khun Chai Tuam's eldest brother as it was he who was made the Chao Khun Kromma Tha before his brother. Khun Chai Chuang, the eldest son of Somdej Chao Phya Borom Maha Prayoorawongse (Dit) and Tunn Khun Ying Chandr and elder brother of Khun Chai Tuam, was born in the reign of King Rama I on 23rd December 1808. He was an extremely talented young man. It was said that he took to reading everything he could lay his hands on and was able to speak and read English quite fluently, being a pupil of Mrs.S.G.Bradley of the American Prebyterian Mission. He became a courtier in the Court of King Rama III and when he became Luang Sith Nai Wane, he happened to travel to Chandaburi, where there are shipyards, building sea going ships and junks. He became fascinated in the ship-wrights at work. He thereupon took up serious research on ship building and within a year, to the surprise of everyone, he began building a number of brigs and presented one to His Majesty. It was said that it was even armed with canon. He rose to be Head of the Royal Chamberlains and received the title of Phya Sri Suriyawongse. In the reign of King Rama IV, when his father Somdej Ong Yai (Dit) became Regent of Siam, he took over his father's other positions, becoming Minister of Defence, as well as Minister of the Royal Treasury, Customs and Foreign Affairs, (Chao Khun Kromma Tha), and his title was elevated to Chao Phya Sri Suriyawongse. These positions he retained right through to the reign of King Rama V. Later on, in order to facilitate state affairs (as at the time if His Majesty was not visiting his subjects in the provinces to see how they fared and find ways to implement improvements for their welfare, he was travelling abroad visiting Europe and Europe on State visits). Chao Phya Sri Suriyawongse (Chuang) was himself installed Regent of Siam in 1872, after his father's death with the title of Somdej Chao Phya Borom Maha Sri Suriyawongse (Chuang). It must be re-emphazed that this was the critical time when both England and France were out land grabbing. France went so far as to occupy Koh Si Chang, and had a gun boat anchored amid stream in the Chao Phya River opposite the Grand Palace. It was due to the foresight and wisdom of King Chulalongkorn the Great, Rama V, that France was kept at bay, when his Majesty asked the Tsar of Russia to exert Imperial Russia's influence that France reluctantly withdrew her forces from Koh Si Chang, and her gun boat weighted anchor and left Siam in peace. 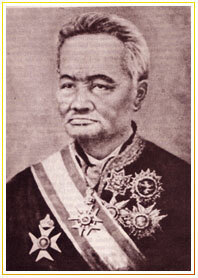 Somdej Chao Phya Borom Maha Sri Suriyawongse (Chuang) passed away on 19th January 1882 at the age of 75. He left one son Chao Phya Surawongse (Worn) and three daughters. His palatial residence in Dhonburi as a memorial was turned into a Teachers Training College known to day as 'The Witayalai Kru Ban Somdej Chao Phya'. Khun Chai Tuam, another of Somdej Ong Yai's (Dit) sons, and the one whose line we are following has the distiction of being the last to hold the position held by his family for eight generations from 1610, in the reign of King Somdej Chao Song Dhum, right up to 1875 in the reign of King Chulalongkorn the Great, Rama V. The position was that of Chao Khun Kromma Tha. He was likewise the first Siamnese Foreign Minister or Cabinet Minister (1875 - 1885) to be able to speak English fluently as he had travelled aboard representing Siam in many Diplomatic Missions, to England, France and the neighbouring countries. Khun Chai Tuam was born in Petchaburi in 1830, and was the seventh son of Somdej Chao Phya Borom Maha Prayoorawongse (Dit), he and one of his elder brothers, Phya Montri Suriyawonge (Dit), he and one of his elder brothers, Phya Montri Suriyawongse (Choom), were pupils of Mrs. S.G. Bradley of the American Presbyterian Mission. Phya Montri Suriyawongse (Choom) had to give up his foreign education sooner than Khun Chai Tuam owing to the call of State duty. Khun Chai Tuam taking the advantage of being able to learn longer, proved himself a very apt student, and became proficient in English, which served him well in his later positions in working in the various government offices.